Last night's Rosenblatt Recital (16 March 2016) at the Wigmore Hall was intended to be a joint recital by husband and wife team, tenor Charles Castronovo and soprano Ekaterina Siurina, with pianist Iain Burnside in which they performed love duets by Mascagni, Puccini, Bizet and Gounod, plus song by Tosti, Rossini, Bellini, Donizetti, Liszt and Rachmaninov. In the event Charles Castronovo was ill and he was replaced, at extraordinarily short notice, by tenor Luis Gomes (making his second unscheduled appearance at a Rosenblatt Recital). The programme was remarkably unchanged, we still had the duets from Masacgni's L'amico Fritz, Puccini's La Boheme and Gounod's Romeo et Juliette, but just had the soprano aria from Bizet's Les pecheurs de perles, and in the songs we lost the Liszt but gained rather more Rachmaninov. 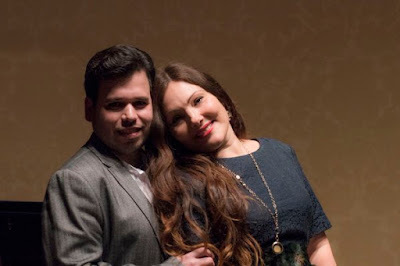 We started with the Cherry duet from Pietro Mascagni's L'amico Fritz, a delightful, rather low-key piece in which both Ekaterina Siurina and Luis Gomes brought out the charm of the work, only ramping up the passion in the final pages. Though singing from a score (just the one, which they shared), throughout the evening the two created a believably strong bond between their two characters and this was anything but a stand and song evening. It was difficult to believe this had been put together at such short notice. Next Luis Gomes sang a group of songs by Francesco Paolo Tosti, L'ultima canzone, Ideale and L'alba separa dall luce l'ombra. Though these songs are popular, and certainly written as crowd-pleasers, they require a strong technique to bring off. Gomes sang with a superb sense of line, and really caressed the phrases. He was often quite understated, knowing when to not do too much and when to really ramp things up. Ekaterina Siurina sang a group of songs by Rossini, Bellini and Donizetti, works written more for the parlour or the salon than the opera house. Rossini's La pastorella dell'Alpi gave Siurina a chance to show off her flexibility in coloratura, whilst charming and delighting us. Bellini's Malinconia, ninfa gentile was sung with fuller tone, and a vibrant sense of line, and in Donizetti's A mezzanotte she sang with really affecting tone. In this last song we also heard the real limitations of this repertoire, as despite Iain Burnside's best efforts Donizetti's accompaniment came over as a simple oom-pah. Finally there was a sequence from the close of Act One of Puccini's La Boheme, though the three parts (Rodolfo's aria, Mimi's aria and the final duet) were sung as independent items rather than a coherent musical sequence. This was no matter, as Gomes made an ardent, refined Rodolfo with Siurina a poised and self-possessed Mimi. There was something believably touching about the performance, and it was certainly unhackneyed. They concluded by walking off arm in arm and singing the final climactic top C off stage as was intended. Part two opened with Ekaterina Siurina's affectingly plangent account of Me voila seule dans la nuit from Bizet's Les pecheurs de perles, in which her confident coloratura was combined with a nice sense of style and strong tone, sung in creditable French. Next came a sequence of seven Rachmaninov songs shared between the two, both singing in Russian. Gomes brought a throbbing melancholy to the haunting Oh, do not sing to me again, which developed real intensity. In How fair this spot he was quiet and intense, almost inward, and Spring waters vibrantly passionate. Siurina, singing in her native language, seemed far less reliant on the printed music than in the Italian items and more relaxed. In my garden at night was plangently melancholy with a superb sense of the words. To her had an interesting edge to the harmony and a fascinating, chromaticism to the melody. The answer was full of impetuosity, whilst in The dream she was seductive with a ravishing translucent texture in the piano. The Rachmaninov song really gave pianist Iain Burnside something to get his teeth into, and he brought the accompaniments vividly to life, with the piano sometimes as important as the vocal line. Finally we had a sequence from Gounod's Romeo et Juliette, first Gomes gave us a finely controlled account of Ah! leve toi soleil where Gomes beautifully evenness of phrase and tone did not preclude passion as well. Then we had the Act Four duet, Va! je t'ai pardonne in which the two brought a lovely sense of passion to the piece, and blended their voices finely. The recital was very well received, but in the circumstances it was unreasonable to expect and encore. In fact we were treated to the conclusion of the duet from La Boheme, again with its climactic top notes.